The well-known organic food brand will launch Amy’s Drive Thru later this summer. In two weeks, an organic farmer at an undisclosed California potato patch will harvest the first crop of potatoes destined for the fryer in the kitchen at the soon-to-launch Amy’s Drive Thru restaurant in Rohnert Park, California. The fast food restaurant with a twist is the brainchild of Amy’s Kitchen, the popular frozen food and soup company. In late June, the meticulously sourced french fries will debut at the official launch of the first Amy’s Drive Thru. Customers have asked the company’s owners to enter into the restaurant business for two decades, says co-founder and co-CEO Andy Berliner, who oversees the company with his wife, Rachel. “About four years ago, we decided to do more of a traditional drive-through restaurant, but with organic, vegetarian, pesticide-free, and GMO-free food,” Berliner tells Civil Eats. The menu, which the company says is made with around 95 percent certified organic ingredients, will be familiar to fast food fans: burritos, pizza, shakes, chili, salads, and, of course, French fries. Creating organic and good-tasting menu items has taken an inordinate amount of work. A task only compounded by the fact that all menu items will be available in regular, gluten-free, dairy-free, and vegan configurations. The price point is higher than most fast food, but inline with fast casual chains like Chipotle and Panera. Customers will be able to buy a meal for under $9 and have it delivered within three-and-a-half minutes, a key to drive-thru success. “Better-for-you,” is how her husband Andy puts it. The couple started Amy’s Kitchen in 1987 when they developed a frozen vegetarian pot pie out of their kitchen in Petaluma, California, a Northern California town that remains the company’s headquarters. Twenty-seven years later, the company has grown an average of 30 percent a year, according to Andy Berliner. With processing plants in Oregon, Santa Rosa, and Idaho, and nearly 2,000 employees, it has evolved into one of the biggest selling frozen food and canned soup companies in the U.S. Since Amy’s Kitchen isn’t publicly traded, and is family-owned and operated, exact sales figures aren’t public knowledge. But on a 2012 episode of How I Made My Millions, the Berliners said the company earned upwards of $300 million in sales that year. Three years later, that number has shot up to $500 million according to a senior manager in communications. At a time when other companies are working hard to remove genetically engineered and other highly processed ingredients from their menus, Amy’s Drive Thru, by virtue of the parent company’s history, has an upper hand. “We haven’t changed. Organic, vegetarian and non-GMO is who we are,” says Berliner. As consumer demand for local and organic food continues to skyrocket, the time has never been better for a venture into “clean” fast food. McDonald’s may have changed their tune about kale, but fast food won’t shake its reputation for industrially produced meat, low-quality produce, and large quantities of of fat, sodium, and sugar anytime soon. Now a new breed of restaurants aim to clean up fast food’s reputation–and change the eating habits for legions of Americans along the way. Indeed, Amy’s Drive Thru is part of a larger trend taking place throughout the U.S.
Chains like Burgerville and Shake Shack fill their menus with antibiotic-free hamburgers, fresh-cut fries, and shakes made from local strawberries. In the Bay Area, high-profile chefs Roy Choi and Daniel Patterson are readying for the fall launch of Loco’l, a fast food joint that will use quality, organic ingredients while maintaining the taste, convenience, and price point of traditional fast food. (Some menu items may cost as little as 99-cents.) In a touch you won’t find at Wendy’s, the hamburgers at Loco’l are tucked between whole-grain buns created by Chad Robertson of the notorious San Francisco-based Tartine Bakery. “We’re blessed to be in California,” he adds, fresh off a morning of sampling cucumbers, straight from the fields, to be turned into pickles for the drive-thru. Still, the restaurant needs to ensure supply, which will likely mean sourcing to the north or south if the demand arises. According to Paneno, Amy’s ag field reps monitor all stages of the growing process and ag managers work through the soil-management, harvesting, and clean-up of the food products, until they arrive for processing at the Amy’s plant or kitchen. As the Berliners see it, all of these locally sourced and pesticide-free foods don’t really matter if restaurant employees work in abysmal conditions for poverty wages. “We’ll be paying more than anyone else in the market,” says Andy Berliner, when asked about entry-level wages for Amy’s Drive Thru. Employees will receive a starting wage of $12 an hour, lower than demands for a $15 an hour living wage in Sonoma County, but higher than the statewide minimum wage of $9 an hour. Employees will also receive medical benefits through a company-owned health center, and vacation days. 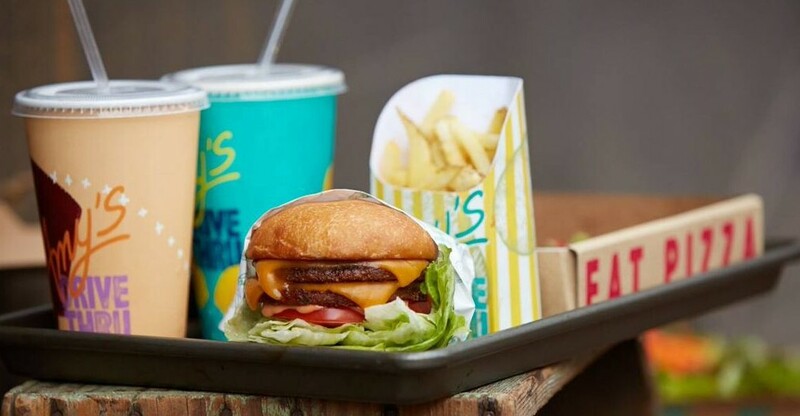 Only time can tell whether sustainably minded fast food joints like Amy’s Drive-Thru and Loco’l will thrive in the face of competition from established fast food giants (the first Amy’s Drive-Thru will be located down the street from a wildly popular In-N-Out Burger). Rachel Berliner recounts how a post about the restaurant’s launch on an anti-GMO website led to hundreds of letters from all over the country. Hope you come east soon We're growing organic tomatoes in Seaford DE. And can grow just about anything this time of year! So glad to hear it. We need good clean fast food. Any plans for Florida yet? I am very interested in being part of gaining an Amy's restaurant for the Des Moines Iowa Community. Hope you come to pa soon! Lancaster grows lots of organic food! Thank you for giving those of us who understand how damaging foods (I use the word food lightly) from McD. Wendys, Arby's and such are. I live in Pa and I hope that you will soon be here and throughout the nation. Best of luck and again thank you. P.S. Please don't ever sell out to the garbage sell companies. great concept, looking forward to the opening . The world needs this kind of consumption change!! Thank you, thank you, thank you!!! We are long overdue for clean and non GMO fast food with healthier options! My dream come true!!! Great news! Just want to remind myself that it doesn't mean its good for you! But natural is always better! As the story mentions, the food will be vegetarian. Yes, the time has finally come for some good, wholesome fast food that is organic and vegetarian! Let's save the cows for ice-cream! And let the chickens roam free! Everybody wins and we become a healthier nation! Congratulations, Amy! And God speed in your new endeavor! Thanks for a helpful, in depth article! This is fabulous News! Just wish it was in Massachusetts.. I would love to know if and when you will be offering franchise opportunities? I would be very interested in opening one here in KY! As a 50 year old woman who has worked 27 years in the plumbing industry, I am ylooking to start my own new venture here in Portland, Or. We take food very seriously up here and I believe Amy's new fast food restaurant will become a booming business. I'd like to open up a franchise for Amy's. Let's see how it goes in Rohnert Park and I'll do some research up here for locations to serve the public. I LOVE THIS! Come to the east coast! Would love to have an Amy's in the Folsom/El Dorado Hills area of CA. I enjoy your products and as a three time cancer survivor would love to go out to eat and be confident that the food I'm eating is actually nourishing my body. I love this article! I hadn't heard of Amy's before this, I live in MD and work outside Washington D.C. and I've been wondering for a couple years if this sort of thing is possible. I always thought that, especially since people here are so rich, if a healthy fast-food option was made available, they'd quickly become obsessed. It's cool to know that this idea has already been turned into reality and has been working great for some time now. This is the kind of place I'd be proud to spend my money and recommend to my friends. I live in Virginia, and I am an Ovarian Cancer Victor, My treatment was a High Alkaline/Low Acidity Diet. I found your soups and some of your frozen foods were within the parameters of my diet. My diet continues and will have to continue for the rest of my life. I love your food, and I am looking forward to more of your foods. All the best of everything to you! Y'all rock!!!!!!! Amy's will now give people a more healthy choice. That is all anyone can hope for. There is an obesity and diabetes epidemic in the US and the average person can not depend on their doctors or mainstream media to let them know the real dangers of eating GMO and pesticide laden foods. I do not think any kind of french fries should be eaten but the reality is some people will eat them no matter what they know. This way is a better way, if not perfect. Thank you. I hope this will be a huge success! Hallelujah! Better have these stores franchised out QUICK! We are at the tipping point! This sounds Amazing! I already enjoy many of Amy's products and as a person with Celiac disease, I would feel good eating at your drive through! Can you please come to Maine? How about a franchise? Is sunflower oil a healthy alternative? Really? Please bring Amy's Drive Thru to Bellevue, Nebraska.♡Will this restaurant offer gluten free options? About time to have one non-GMO burger fast food, do you do franchise? I'm so excited to have a place like Amy's coming to my area. Finally a place to get a quick meal that is in line with my way of eating. Bring it on!!!! Amy' please come to Evansville Indiana,Now. I'm hungry for healthy Real food.you've got it and I want it, Now!!! The picture shows a burger but there is no mention of burgers in the story. I understood Amy's to be a vegetarian company, because when I called to suggest that they use microencapsulated fish oil in some products they said that was impossible. My point was that parents could buy enriched foods like that to insure their kids get get enough DHA and EPA in a food form (it is the equivalent of adding some powdered milk or nutritional yeast to a food to make it more nutritious). DHA and EPA are crucial for immunity, mental health, and intellectual capacity, and most Americans are deficient in these essential fatty acids (probably because the government refuses to set a standard requirement for them). School food contains zero DHA and EPA. Please come East!!! Love Love Love Amy's products. Wishing that we had an Amy's in North East Pa..
Good Luck to you at Amy's. we could use a few of these in Orange County California. I know lots of people that love your frozen products and would go crazy over this. I am thrilled to see Amy's moving into the "fast food" market. I use many of Amy's products because they are kosher and non-meat and non-dairy. I hope you will come to the Long Island, NY area. Thank you for your wonderful products. i would love to see you in Florida too!! We have many local organic farms all over!! I hope you are so very successful in this endeavor that you can go nationwide as I'm in Ohio. I am an organic gardener and have been for forty one years. This year I was finally able to plant entire non gmo plants and seeds! Best of luck and please consider coming this way! I am so happy to see this! I am a recent graduate of Le cordon Bleu in Atlanta, and an advocate for healthy cooking and baking. I told my classmates that this was going to be the new trend but they laughed at me!! Please come to ATL! Please come to the Bellevue Washington area too!!!!! Awesome this is needed as more people become aware of the gmo lies. Please open one on Maui when things move in that direction. I believe you have a gold mine here! Thanks so much for having healthy food options! This will succeed wonderfully. One of the most popular and terrific restaurants in Philadelphia is Vedge. Hard to get a reservation there. Americans are waking up to understanding that processed food from animals full of antibiotics and hormones and vegetables and fruits sprayed with toxic chemicals are responsible for our obesity and many of diseases like diabetes type 2.
would love to see this come to Syracuse, NY area! You should open one in novato. We would love to see come to Klamath Falls, OR!! Right on the California boarder and there is a Army base here who would love your food! As a 25 year vegetarian and clean eater, I have raised 4 vegetarian kiddos. Throughout all of these years it has been so challenging to eat outside of home, so I'm very excited with this idea! I hope very much that its a success and that you can quickly expand to northern Oregon or southwest Washington. Your convenience meals have always been an enjoyable treat for our family. Thanks for what you do and good luck! Please come to Delray Beach in South Florida!! This is soooooooooo AWESOME!!!!! We desperately need this type of fast food restaurant!! I do hope it will make it to North Carolina soon! Hope you come to Houston, TX soon! I would LOVE to see something like this in WI where I live. Have wished this for a long time... Hopefully someday it'll happen here. Thanks for seeing that Vision and acting on it!! Can't wait til an Amy's Fast Food Drive Thru comes to NH! Real food a gluten/lactose person can get and not get ill! I hope to see a franchise in SoCal soon! We need more establishments like this! I would love to have Army's restaurant out here and I speak for Many others in Missouri, Me and my fiancé would love to help be apart of helping make this happen anyway we can. Please! And Thank You! Love Amy's products, love this idea! If only I lived in Cali instead of Wisconsin - I could eat out without wondering what I was eating and I could apply for a decent job without selling my soul! Bravo Amy's! So proud of you starting a healthy fast food drive thru restaurant . I hope it's wildly successful so you can expand to Orange County. Forever grateful to you for providing organic and non GMO choices to the public. This sounds fantastic! I've been vegetarian for 5 years and love Amy's goods. We need more locations, especially in Philadelphia!!! I've been eating Amy's products since the beginning , love the idea of a fast food restaurant , I've always said we need one here in. ventura, ca Please !! I am so exited you are going to Open your Restaurants, hopefully there will be one not too far away from us. We need to start eating healthy in USA free of all the harmfully grown fruits and veggies, as well as meat that has been fed all the unhealthy hormones and whatever else bad. Please, hurry! Hope some day to see one in Cleveland, Ohio. More and more people are demanding organic foods. Earthfare, and Whole Foods and Trader Joes are in the area. Now we need Amy's! bring it to Georgia! metro Atlanta would love this! Quick food when out and about and hungry and gluten intolerant has been nearly impossible. Add in my preference for cruelty free & non GMO food, and the options shrink dramatically. I usually try for a taco truck. Quality varies, but generally the corn tortillas are GF. Recently there has been a trend towards mixing flour into the (apparently) corn tortillas. Without safe tacos, my options dramatically decrease. Thank you, Amy's, for bucking the trend. Don't forget the Central Valley! Stockton would welcome you. YES PLEASE!! I'm in Texas..& i've yet to find Amy's in the freezers here..but I've had Amy's before & my sister in Washington gets them regularly...I'll be excited when one gets built here..but in the meantime...can u send your frozen meals & soups my way!!! Please come to Kentucky. We need healthy food. Announced Sept. 2014, General Mills bought Amy's. So happy to hear someone is stepping up to the (real food) plate!!!! Thank you so much. Hope I am still around when you expand to southwest Fl!!!!!. While you have not yet come to my area, I applaud your efforts! I moved recently from the Calistoga area to an area renown for forward thinking, Ojai, Ca. Perhaps one day soon I may be able to enjoy benefits of your efforts. Than you for your forward thinking. Best of luck in your endeavors. Thank you so much. I would be proud to work at Amy's in place of corporate America. I'm so excited to possibly have a great place to eat. Bring one to Rancho Cucamonga, California, please need one. I just want to thank Amy's kitchen for taking the initiative in this life changing project. I hope that it expands and eventually changes the entire fast food industry. I believe that fast food is the heart of Americas poor eating habits and if this begins to change, maybe the world my daughter grows up to live in will be a healthier place. You have many loyal customers (and employees) waiting for you in Montana! Great amounts of love and respect from me, my family and friends. Any chance you will be opening one up in the Orlando area??? Bravo for Amy's Kitchen and its great products and enlightened philosophy and congratulations on your new venture of Amy's Drive Thru! I have been enjoying Amy's Kitchen's canned and frozen food since the company first started in 1987. As a vegetarian for nearly 20 years, I appreciate having the variety of options offered by Amy's Kitchen to choose from for a nutritious and delicious meal. It has been a delight watching the building progress at the new restaurant site; especially the old-fashioned looking water tower and the roof garden. It looks like attention to detail is a top priority at Amy's Drive Thru. "Better-for-you" choices are a sign of the times because as the saying goes, "You are what you eat." P.S. to the person who commented that Amy's Kitchen sold to General Mills, that is a false statement. It was Annie's. Bummer, because I like Annie's products too. Bring Amy's Drive Thru our way, Please. I live in Bakersfield C.A. Please come here. I will spread e word and I;ld even work for you part time. Your great!!!!!!!!!!!!!!!!!! Where in California are you opening? I need an Amy's drive thru in Toronto please! Love the food! All of it. Good luck Amy! I am so glad to learn about Amy's Drive Thru Restaurant which is opening in California! All I can say is, "It's about time!" I live in the DC area and would love to see another opening in our area. My son became a vegetarian over a year ago, and he hasn't tasted a bite of meat since, not even a small nibble! It has been baby steps for the rest of us but I see major changes in our meal planning and restaurant choices. I believe that is the key with this type of restaurant, baby steps, so we can save our beautiful, sweet, animal friends. Thank you for all the energy, trial and error, that went into getting this restaurant started. Wonderful!!!!! Please bring one to southern California!!! I'm confused. Will the food all be vegetarian? I thought so from this statement: "we decided to do more of a traditional drive-through restaurant, but with organic, vegetarian, pesticide-free, and GMO-free food." But then later in the article it says: "there are chicken nuggets [on our menu], but those chicken nuggets are made using really good birds" ?? If you read closely, you'll see that's a quote about a restaurant called Loca'l. there? If so, I know the location...(used to work there). markets in Ukiah, and my vegan son swears by them! my BIG question has been..."and would it be asking too much for these foods to be both tasty and delicious"? to continue...Amy's will be wildly successful! all who are looking for healthy alternatives to the poison-filled selections we find on our nation's grocery shelves! Your prices may be higher than others, but perhaps in time as your business expands, they could be reduced to be more assessable to families with hungry children with voracious appetites! (I've heard it often said that it's difficult to feed families organic foods because they cost more...even though they are better)...and grocery chains are now featuring organic food sections--thanks to businesses such as yours...Congratulations! I would love to hear from you...and help promote your business! You should come to Orlando Florida. You will not be sorry. Please come to Portland Oregon - St.John's area. we are low on restaurants - I would love a GF option that I wont have drive across town for. I used to live next to Amy's plant in West Santa Rosa and bought many of their frozen food items. Please let me know when the fast food restaurant opens in Rohnert Park. It will be only 20-25 minutes away. OMG, I just ran across this site. This is amazing. i only wish we had one closer to where I live in Santa Barbara. I have so much trouble eating out, we go to any fast food and I just elect not to eat because I dont trust some high school kid cooking food and telling me its gf and they dont know. Its sad and I feel so helpless that I have to starve sometimes on the road. I usually pack all my own food, even going back home just to be safe. Amazing, great job Amy! Wow...this is exciting...I pretty much live on Amy's frozen foods now. Of course, being all the way here in SC the chance of us seeing this here anytime soon..is remote to say the least. Wishing they company the best. Would love to see one here someday!!!! PLEASE consider Fayetteville, Arkansas for one of your new organic restaurants.....PLEASE! We have a large population consuming organics with a new Natural Grocers and a Whole Foods, being built as I write and an all organic co-op. We're a college town in the Ozark Mtns. with many attributes for wholesome living, supporting organic farming (numerous private and communal farms) and our population goes back to the first hip movements of the 70's. Not only that but my freezer is full of your entrees' and pizza. Every grocer in town sells your food....even Wal-Mart. You'd be a total success here in Fayetteville and very much welcomed! Again, PLEASE consider our town. Best wishes on your new adventure! You will have GREAT success! I am really excited about your entry in a Vegetarian fast food restaurant. I would be interested in being owning a franchise. Also would be interested in assisting in Franchise development. As a grandmother of 11 kids I love to see El Paso Texas in your list to install one of your restaurants here. There's a lot of people realy concern about GMO in their food and very compromise with organic food. When would this restaurant arrive in the Abingdon, VA, area? Restaurants of this nature are needed and would be most popular nationwide. You go Amys! It is about time we have an organic drive thru! I am so delighted! I now live in Sacramento so, will be waiting for the restaurant to come here. I am thrilled. I can't wait for you to come to Southern Calif. (Oceanside to be exact). We're hungry for you. Buying nonGMO and Organic is a must. The health of our country depends on it. THANK YOU, THANK YOU, THANK YOU. My personal favorite is Amy's frozen Tofu Scramble and I offen clear the shelves. PLZ PLZ PLZ BRING YOUR CLEAN FAST FOOD TO SO CAL!!! You will make a KILLING while allowing us to at least try to LIVE Cleaner, a tad bit healthier lives! :) As a business owner, I am only too well aware of how profits matter, but Lives Matter More! Thank you! Please keep me posted. I might be interested in opening a franchised for you. Great idea. Great food options. I will seek you out when in the States. Chicago. I am a BIG customer of your product. You can call anytime. Not sure how to keep my excitement in check on this- So let me say this if the time comes that you are interested in opening a drive through on the east coast more specifically Monmouth county New jersey I would like to participate. I grew up in the food concession business that my father had started and later went into the metals business. I have a daughter who went to culinary high school and then onto Johnson and Wales for 2 years and finally switched majors and graduated from Hofstra University with a business degree. She would love to get into the food business and this would be a great opportunity. if franchise become a part of your future please consider us. When will we see Amy's restaurants on the East Coast? Preferably in the Maryland area, where we live? What are you present expansion plans? Are Amy's franchised, or privately owned and operated? I don't necessarily agree, nor should your make it appear, that Panera's is your main competition. Panera's low keys the natural food aspect of their operation. It emphasizes fresh, although much of it is frozen and precooked. Yours, whether you're accepting of it or not, is presumed to be in the natural food vein. There's a tremendous demand for natural foods in a fast food restaurant arrangement. Your frozen supermarket items are much better than anything else being sold in that venue. And you don't even advertise, which speaks volumes about how highly you are regarded in competition with other products, not nearly as healthful nor flavorful. I look forward to hearing from you on your wonderful restaurant concept.